Mask: Optional. The color of each light is scaled by the color of this clip at the center of the light. A black and white mask can be used to create lights that are obscured by foreground objects. A color mask will colorize the lights, which can give the appearance of the lights passing behind a partially-transparent object. Brightness: Default: 0.5, Range: 0 or greater. The overall brightness of the lights. Color: Default rgb: [1 1 0.3]. The overall color of the lights. Vary Hue: Default: 0, Range: 0 to 1. Randomly varies the hue of each light. Vary Saturation: Default: 0, Range: 0 to 1. Randomly varies the saturation of each light. Vary Brightness: Default: 1, Range: 0 to 1. Randomly varies the brightness of each light. 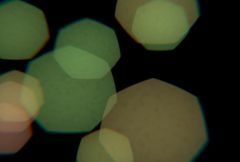 The overall size of the defocused lights. This parameter can be adjusted using the Size Widget. Vary Size: Default: 0.2, Range: 0 or greater. Randomly varies the size of the lights, to simulate lights that are at different distances from the camera. Softness: Default: 0.01, Range: 0.001 or greater. The softness of the light sources. Increase this for blurrier lights. Lights: Integer, Default: 30, Range: 0 or greater. Drift Speed: Default: 0.2, Range: 0 or greater. The speed at which lights move around the screen. Drift Distance: Default: 0.5, Range: 0 or greater. The maximum distance that each light will move. Drift Size Speed: Default: 0.1, Range: 0 or greater. The speed at which lights change their size. Drift Size Distance: Default: 0.3, Range: 0 or greater. The maximum amount by which each light's size will change. Drift Smoothness: Default: 0.65, Range: 0 to 1. Controls the amount of high frequency variation in each light's motion. Increase this for a gentle drifting motion. Decrease for a jerky shaking motion. Translation speed of the lights. If non-zero, the result is automatically animated to shift at this rate. The result of animated Speed values may not be intuitive, so for variable speed motion it is usually best to set this to 0 and animate the Shift Start values instead. Translation offset of the lights. Use Source Color: Default: 0.25, Range: 0 to 1. Scales the lights by a smoothed version of the Source clip. Increase this to help the lights blend with the background. Smooth Source Color: Default: 0.4, Range: 0 or greater. The amount to blur the Source clip before scaling the lights. Has no effect if Use Source Color is zero. Shape: Popup menu, Default: 7 sides . Roundness: Default: 0.3, Range: any. Bokeh: Default: 0.5, Range: any. Lens Noise: Default: 0.5, Range: 0 or greater. Noise Freq: Default: 20, Range: 0.01 or greater. Chroma Distort: Default: 0.05, Range: any. The amount of random flickering of the lights. Flicker Speed: Default: 0.5, Range: 0 or greater. Flicker Randomness: Default: 0.7, Range: 0 to 1. Controls the variability of the flicker. When set to zero, the lights will flicker constantly, with a small amount of random variation. At higher values, the flickering will have longer steady spells, with the occasional large spike. Initializes the random number generator for light positioning, size, and color variation. The actual seed value is not significant, but different seeds give different results and the same value should give a repeatable result. Determines how the lights are combined with the Source clip. Add: the lights are added to the source. Lights Only: gives only the lights with no background. If this value is positive the output Alpha channel will include some opacity from the lights. The maximum of the red, green, and blue light brightness is scaled by this value and combined with the Source Alpha at each pixel.